12 Ways to Empower Government Users With the Microsoft Business Intelligence (MBI) Stack | Blue Mountain Data Systems Inc.
Are your organization’s Federal IT resources under constant pressure, with no end in sight? Your agency is not alone. With limited access to dedicated information technology resources, non-technical end users often play the waiting game, relying on IT staff to do simple tasks like generating custom queries and embedding them within applications. Your department’s need to generate on demand, ad hoc reports gets pushed to the back burner while IT resources respond to more pressing matters. Implementing a self-service approach alleviates your IT staff from such tasks, affording them more time to focus on solving high impact problems. With the 2013 government shutdown and sequestration on our minds, proper allocation of IT funds is critical for budgetary survival. Although the federal government plans to spend a mere 2% of its $3.9 trillion budget on IT resources (SOURCE: Agency FY 2015 IT Budgets), there’s no guarantee that your IT budget will escape future cuts. Since February 2011, government agencies have struggled to comply with US Chief Information Officer Vivek Kundra’s Federal Cloud Computing Strategy (known as “Cloud First”). This directive, released through the Office of Management and Budget, requires agencies to give cloud technology first priority in developing IT projects. (Source: GovIT Journal). Three years later, compliance under this policy is still a challenge. How can we maximize ROI in Federal IT and move toward Cloud First compliance? One way to mitigate the risks of budgetary constraints is to discontinue the habit of relying on IT resources for small tasks that users can either do themselves or with limited assistance. Your agency’s use of Microsoft Business Intelligence (MBI) tools and reporting services may hold the key to advancing your organization’s return on investment as well as gain much needed autonomy for your users. Build a user friendly, cloud-based computing solution (e.g., Microsoft Power BI for Office 365) that’s simple to use and easy to maintain with the same Microsoft products your staff use every day. As a result, the learning curve will be low for your staff and make the transition into the business intelligence world less painful for all involved. Once the Power BI site is in place, end users can access the system on the go, share ideas, and take ownership of their individual and collective projects. Allow users to perform data analytics in real time and create custom reports and templates on the fly by simply dragging and dropping components to make reports as needed. Moreover, with an easy to use framework, users can generate many types of reports without IT intervention. Use SQL Server Analysis Services (SSAS) to unleash the power of Excel. With data mining algorithms, users are able to “data dive” to obtain the results that they need to turn data into useful information without manually sifting through tons of data. In addition, the PivotTable and PivotChart tools create visual representations that are easy to manipulate and modify, as necessary. Set viewing, editing and access permissions on a “need to know” basis. Give users the appropriate rights they need to do their particular job functions. Document versioning controls within SharePoint allow for several iterations of the same document to be stored as separate files on the system. Only one version of a document is viewable at a time. In addition, reverting back to previous versions is possible with very little effort. SharePoint’s check-in/check-out functionality prevents document overwrites, ensuring document security. End users check out documents when they need them and check them back in when they are done. SQL Server Reporting Services (SSRS) integrates within a SharePoint environment, permitting users multiple options for reporting in Excel, Visio, and SharePoint. Users can access reports on any device that supports Windows 8.1 and HTML5 via the Microsoft Power BI for Windows app. This functionality provides even more opportunity for sharing and collaboration with staff. Documents are synced between the device and the cloud, ensuring that document integrity remains intact. SOURCE: Microsoft Corporation. Use Power Query in Excel to ask specific questions in “natural” non-technical language. Users can manipulate information by filtering, sorting, forecasting, and highlighting data. Configure data refreshes without much disruption to your team. This ensures that all team members instantly have the most recent updates. The SharePoint KPI list can be added to a SharePoint site and configured to display color coded icons (e.g., green, yellow, and red) to indicate KPI status. Monitoring KPI performance is critical to predict the success of your organization. 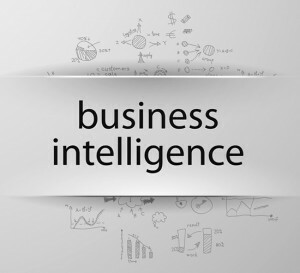 Microsoft Business Intelligence tools are tremendously powerful and offer significant efficiency when compared with programmatic support required for the creation of ad hoc queries. They do, however, require an investment of IT resources to establish a BI strategy and framework. Microsoft’s implementation vision of thinking big and starting small is key to proving the value of BI for analysis and reporting, as well as to ensure buy-in by management and users together. 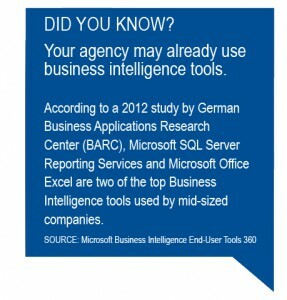 For your Microsoft Business Intelligence needs, contact Blue Mountain at 703-502-3416. We can help you to establish a strategy, framework and reporting structure to enable you to begin effectively using BI tools.